Elite Parking takes great measures to make sure that all the employees they hire are both competent and well-trained prior to stepping onto one of our properties. We place providing ‘first class’ customer service as our company’s main goal and believe that taking extra measures when it comes to employee training cuts down on high-turnover rates. All of our employees must attend a monthly in-house training boot-camp. For those employees who don’t adhere to our policies, we insist on them attending the training on a weekly basis. Loss prevention is the concept of establishing and ensuring that certain policies and procedures are put in place in an effort to prevent the loss of money or unnecessary damages in a business environment. Developing a good employee training program that covers this concept will help reduce the frequency that these losses occur or in some cases prevent the loss from happening at all. When a company experiences a loss, it affects their ability to be profitable. Damages, theft and unstructured employee time can cost a business to lose monies that cannot be replaced. Elite Parking works with a hands-on training approach with all of their current and potential employees. Elite Parking Revenue Controls was recently revamped to encompass the monitoring of day-to-day operations including: video surveillance at all locations; parking software automation; ticket tracking; employee tracking; vehicle tracking and key tracking. Huge congrats to Rebeca Juri for receiving January’s employee of the month! Rebeca started working for Elite Parking in August 2015 and is the company’s Office Manager. She is the backbone of the company’s administration and handles a variety of areas including administrative invoicing, accounts receivable and payable, payroll, HR issues and compensation. Rebeca embodies what it means to be a leader, a team player and a role model of Elite Parking’s core values. Rebeca is a Miami native, having moved here from her hometown of New Jersey at the age of three months old. She started her career in banking and spent more than 15 years in the industry. After leaving the banking sector, Rebeca became a Senior Controller for prominent Miami law firm. Since, then she also graduated from Bible College and obtained a ministerial degree. She pursues her other passion in her role at the Miami Vineyard Community Church where she is a leader of their 12-step Celebrate Recovery program, (en Español). Rebeca also holds an active Florida Real Estate license. As the Office Manager Rebeca plays a big part in day-to-day operations, assuring that ‘first class service’ is the top priority. Elite Parking helps Christies NY make lasting first impressions! 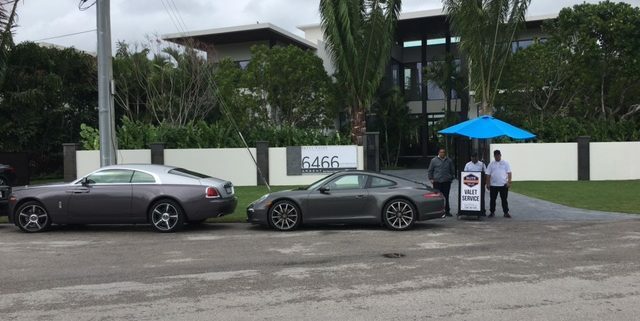 Elite Parking, a local leader in Valet Parking in the South Florida area was entrusted by Christies NY for their special event parking. Elite Parking managed the event parking, valet services, and logistics of the event. Christies NY was extremely happy with the white glove services their guests received by the well-trained and cordial Elite Parking staff! http://elite-parking.net/wp-content/uploads/2016/11/IMG_4445.jpg 480 640 admin http://elite-parking.net/wp-content/uploads/2015/09/Elite-Parking-Logo.png admin2016-11-03 08:03:232016-11-03 08:05:00Elite Parking helps Christies NY make lasting first impressions!